Hogwarts Founders. 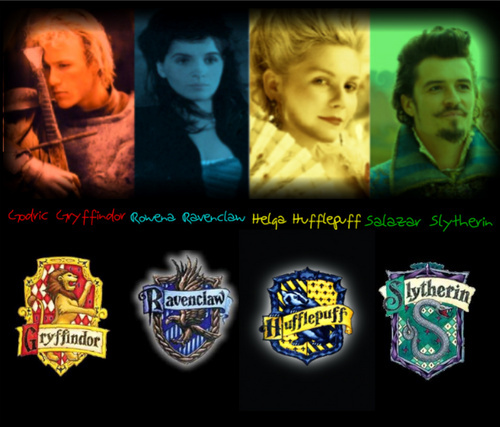 Gryffindor-Heath Ledger, Ravenclaw-Juliette Binoche, Hufflepuff-Kirsten Dunst, Slytherin-Orlando Bloom. HD Wallpaper and background images in the Гарри Поттер club tagged: harry potter characters hogwarts founders. By the way, the background behind the Hufflepuff coat of arms is a little lighter than the rest. I assume that wasn't on purpose. Hufflepuff's colours are black and yellow, but I'm sure that was just a mistake on getting the picture through. yeah it was-none of the hufflepuff pictures worked! Ravenclaw and Hufflepuff have white around them-i couldn't find any others with black background! I chose them myself-the picks didn't come into it-i disagreed with the outcome!!!! !